It’s fascinating to compare and contrast the ways in which raw reality and artful contrivance are blurred to the point of irrelevance in Elizabeth Mims and Jason Tippet’s “Only the Young” and Bill Ross IV and Turner Ross’s “Tchoupitoulas.” Both documentaries center their whimsy-tinted lenses on young people coming of age, though whereas “Young” is more interested in plot and character, “Tchoupitoulas” is a pure sensory experience in which the viewer is made to feel like a participant in the action. That isn’t to say one film is better than the other, since they each succeed on their own terms. At first, “Young” seems to be a mere portrait of two inseparable high school buddies, Garrison Saenz and Kevin Conway, as they skate through their desolate, often adult-free California town. Yet the film is taken to a whole new level once Garrison’s on-again, off-again girlfriend, Skye Elmore, enters the action. Her uninhibited honesty and eloquence make her a fascinating screen character, particularly after her break-up from Garrison fails to dampen her affection for him. Though Garrison never kissed her, Skye says that his love for her was special in that it didn’t need to be conveyed in physical terms. “Kisses are a waste unless there’s something behind them,” she replies. In an uncommonly candid audio commentary, Mims and Tippet reveal that they were in a relationship during production and had subsequently broken up, thus lending a poignant meaning to the film’s theme of temporary yet vital connections that enrich one’s life. The filmmakers’ behind-the-scenes romance may have also helped their young subjects feel more comfortable in opening up about their own love lives. There are a handful of moments in the film that feel vaguely staged (a well-timed Galdalf impersonation comes to mind), yet for the most part, Mims and Tippet do a remarkable job of capturing the authentic yearnings and epiphanies of budding adults with the painterly compositions and insightful eyes of true artists. 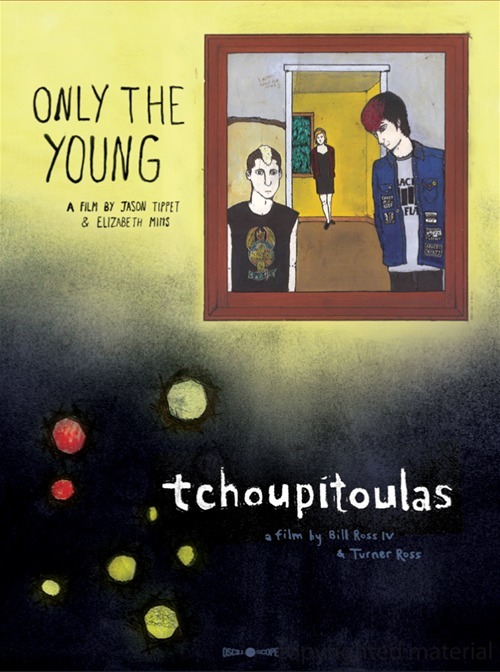 Only the Young and Tchoupitoulas were released on DVD on April 30th, 2013. Whereas Mims and Tippet kept a respectful distance from their characters in “Young,” the camera is placed so close to the young stars in “Tchoupitoulas” that we feel as if we’re viewing the world through their awe-struck eyes. In a delirious mosaic of exuberant nightlife, three brothers take a ferry to New Orleans to sample the town’s buffet of forbidden pleasures. The youngest, William Zanders, is often ignored by his siblings, though his excited, stream-of-consciousness ramblings contain a great deal of arresting poetry and wisdom. Each of the film’s episodic meditations are bookended by William’s voice, which hovers in the ether like a meditative spirit, grounding the chaotic spectacle in a sense of vulnerable humanity. On the heels of their acclaimed 2009 directorial debut, “45365,” the Ross brothers have again proven to be the closest soul siblings to Terrence Malick in the modern realm of documentaries. There’s no narrative to speak of in this picture, just vivid emotions rippling through a sea of cheerful decadence. With a stunning commitment to objectivity, the filmmakers simply observe the Zanders trio as they miss their ferry and are left stranded in New Orleans, as midnight parties give way to hazy, vacant streets. There’s an especially unsettling moment when the filmmakers follow the boys as they sneak onto an eerie ship that may or may not be uninhabited. This is an exhilarating ode to the thrills of youth and the almost spiritual ways in which they impact one’s evolution as a human being. “Only the Young” and “Tchoupitoulas” are presented in their 1.78:1 aspect ratios and are each accompanied by extras. The 15-minute featurette for “Tchoupitoulas” is nearly as delightfully abstract as the film itself, and includes a phenomenal percussive solo performed by a man simply drumming on benches and tables at a bar. In addition to the director commentary, “Young” also includes Mims and Tippet’s 2009 short film, “Thompson,” which clearly served as a dry run for their feature. There are also 15 minutes of deleted scenes bolstered by Skye’s amusing hypothetical impersonation of Garrison’s seemingly inevitable break-up with his latest girlfriend. ‘Only the Young’ and ‘Tchoupitoulas’ are released by Oscilloscope Laboratories. ‘Only the Young’ stars Garrison Saenz, Kevin Conway and Skye Elmore, and was directed by Elizabeth Mims and Jason Tippet. ‘Tchoupitoulas’ stars William Zanders, Bryan Zanders and Kentrell Zanders, and was directed by Bill Ross IV and Turner Ross. They were released on April 30th, 2013, and are not rated.